A new eatery aimed at busy east Boulder County commuters will make its way into Lafayette this January — a barbecue and brewery joint that will serve up six-packs of its own beer and dinner mostly through the convenience of a drive-thru window — under father-son team Tim and Shem Trapp from Trapp Associates Ltd.
Uturn BBQ, which will fill the now-defunct 3,800-square-foot Burger King building at 599 Crossing Drive before the chain relocated to Erie this summer, follows in the vein of Lafayette’s recent move to attract unique and popular local restaurants, including William Oliver’s Publick House and Ras Kassa’s Ethiopian Restaurant. Uturn BBQ will offer “premium” barbecue and signature beers available through indoor-outdoor seating and a drive-thru, according to the duo. The Trapps will also implement a seven-barrel brewing system and “the best there is” in-house meat smoker, according to Tim Trapp. “What could be better than pulling your car up to get barbecue and have a six-pack included?” he asked. Originally, Trapp wanted to sell six-packs of easy-drinking beers such as Pabst Blue Ribbon through the window. However, state liquor laws don’t allow restaurants to sell beer to go unless they brew it themselves, he said. The family hired Alex Violette, an award-winning former head brewer at Upslope, to design the beers — an American-style stout and a German-style kolsch. For the second beer, Violette obtained a special kolsch yeast strain from Cologne, Germany. On the food side, the Trapps have hired Bill Heckler, the former head chef at CraftWorks to take regional barbecue traditions from around the country and put his own spin on them. While this is the first restaurant the pair have opened themselves, Trapp Associates has designed more than 350 restaurants-breweries throughout the United States, including local projects Fresh Thymes and the Walnut Brewery, and for national chains including Rock Bottom Restaurants, Gordon Biersch and Jim ‘N Nicks BBQ. Stir, the newest Chattanooga restaurant concept by SquareOne Holdings, is now open at the Chattanooga Choo Choo in a refurbished space that meshes Chattanooga history with a modern, urban feel. Stir’s ‘New American’ menu offers bold, seasonal, local fare with a new-age spin, said officials. The ingredient-driven dining experience offers from scratch gourmet in a casual-hip atmosphere, including oysters at the dedicated raw bar. Stir uses ingredients predominately from farms and vendors within 100 miles of Chattanooga through the restaurants partner Harvested Here. 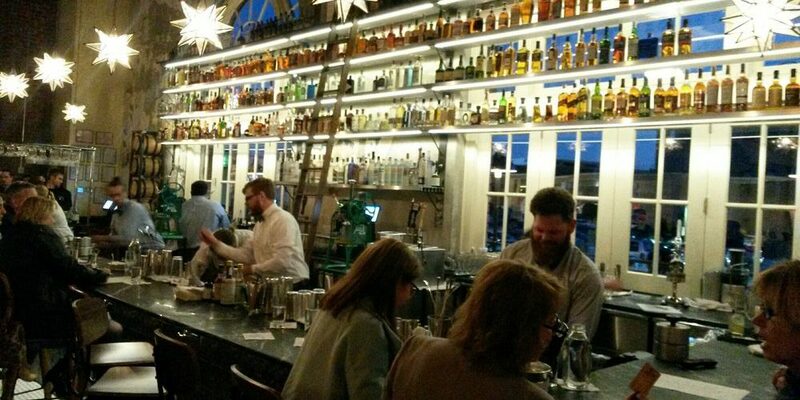 Artisanal ice plays a role in Stir’s bar concept – with purified slow melting ice in each cocktail. Cocktail recipes were created in partnership with bartender and 20-year veteran Gary Crunkleton from a selection of more than 350 spirits. Indoor seating accommodates up to 200 guests, and outdoor seating up to 100 guests in the Chattanooga Choo Choo’s newly renovated space. The original structure dates back to 1908 and the restaurant has updated the inside and out while keeping many original elements exposed and intact in the 5,300 square foot restaurant. Private parties can accommodate up to 40 guests in the “Kabooze Room” and an additional 40 on the private terrace. In support of its partnership with Chattanooga Community Kitchen, Stir will make a donation to the organization in celebration of the restaurant’s grand opening week. The restaurant is open Sunday from 10:30 a.m.–12 a.m. with brunch served from 10:30 a.m.–2 p.m.; Monday–Thursday from 11 a.m.-12 a.m. and Friday and Saturday from 11 a.m.–1 a.m.
Local partners include Chattanooga Community Kitchen – non-profit philanthropy; Clumpies – ice cream/dessert; Fleetwood Coffee – coffee; Graphic Designer Joe Tenison – logo design; Harvested Here – local food; Industrial Farmhouse – furniture design; Niedlov’s – bakery items; Riverworks Marketing Group – website; The Hot Chocolatier – dessert and Waterhouse Public Relations – public relations and social media. National and regional partners include Gary Crunkleton – bar concept and Trapp Associates Ltd.- architecture and design. You might be expecting an introduction to the Balter family at this point. It turns out “Balter,” according to the Balter Brewing website, is a verb meaning to “dance without particular grace or skill, but with enjoyment.” Sounds like a fun place and that’s exactly what Blaine Wedekind told me they intend to build at the corner of Jackson and Broadway – the site of the former Corner BP. In short, the concept is a craft brewery with a restaurant serving “elegant bar food,” a beer garden and sometimes scene for live music. 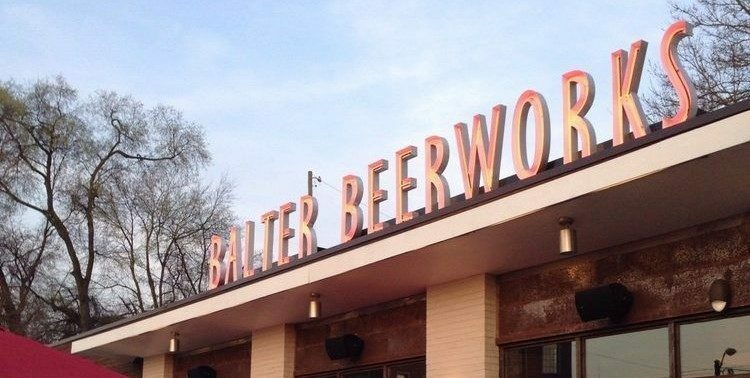 Sounds like a place one might just decide to balter. Blaine is a fourth generation Knoxvillian. A West High School graduate, he earned a business degree at the University of Tennessee and worked for Cherokee Distribution. His partner in the new venture will be responsible for the brewing portion of the equation. The partner (and friend) isn’t ready to be named just yet, but has home-brewed beer for eight years and has some commercial experience. He also has a degree in bio-systems engineering, which should come in handy. While the two partners developed the concept and will manage the business, they are joined by several equity partners including Blaine’s father, David. The brewing component will include a seven barrel system with the intent of creating, “big flavorful, unique beers.” Blaine said the two, “want to help put Knoxville on the map for brewing trips.” They want it, “to be an experience for the beer explorer.” The intent is to brew enough beer for the brew pub and for customers to take home in growlers. They have no plans to bottle or distribute the beer, meaning people will need to come to Knoxville to experience it. Available beers will include an IPA, Brown Ale, Porter, a Huckleberry Wheat Ale, and a Breakfast Stout. That one caught my attention. He said breakfast malts would be used. I’m certainly intrigued. They will also serve wine, which he assures me will be of a good quality (he’s considering Decoy Wine) and they will also have a full bar with craft cocktails. He wants everyone to find something to enjoy. By “elegant bar food,” Blaine means simple meals that can be easily prepared, but which include quality ingredients, which he hopes to source locally as much as possible. They are planning to have sliders and at least one burger. He’s interested in street tacos featuring locally-made tortillas and an extended appetizer selection. They plan to have fresh vegetables and food not commonly found downtown. In other words, it will be light, but with gourmet flair. He wants the food to be of a quality that people will consider it a lunch spot – with really great beer. They’ve already begun assembling a staff and have already secured the services of a chef and general manager. Once they reach full staffing, he anticipates having fifty to sixty people on payroll. They are looking to partner with a local farm for beef and other products and would like to recycle their spent grain back to that farm. They want the staff to be knowledgeable about craft beer in order to enhance the experience and, hopefully, inspire potential home brewers to give it a try. A beer garden will also be included, which is where you might encounter live music. From the beer garden, patrons will be able to watch the brewing process and ask questions of the brew master, if they like. The intent is to have a comfortable, educational and fun experience that will inspire patrons to be more involved and out-of-town guests to travel to the city to give the beer a try. John Sanders is working as local consultant, while Tim Trapp of Trapp Associates is handling the design end and Allen Corey of Square One Holdings is providing support on the business end. In a special arrangement, Carolina Brewery of Chapel Hill has agreed to have Blaine and his partner work with them for the next three months in order to learn the operations side of the business. He points out that the Mayor’s office, and Bob Whetsel in particular, has been very helpful, making it possible for them to do the project. Parking is also available on site for out of town visitors or people simply driving in from out of downtown. They will also provide bike racks and hope to promote walking and biking to the pub which is directly between downtown proper and the northern ring neighborhoods. The tentative plans include beginning production in May, with an eye toward a potential opening date of August 1. They expect large game-day crowds in the fall and hope to have some practice time before the business heats up to that degree. They anticipate hours will be 11:00 AM to Midnight. So there’s more of the good news I told you would mark this year – and there’s more to come. Check out their website and like them on Facebook so they know the love that’s coming their way. I’ll see you there when the weather is warmer. Longmont-based Oskar Blues Brewery, just six months after opening a restaurant on the southern edge of Longmont, is considering opening another — most likely in Fort Collins. “This year is starting off with a bang,” said Dale Katechis, founder of Oskar Blues. In early February, Oskar Blues’ architectural design firm submitted a conceptual review application to the city of Fort Collins for a remodel of 350 Linden St., a 101-year-old building called the Union Pacific Freight Depot, according to city documents. The application proposes a 300-seat restaurant in the 6,600-square-foot space that is vacant. Katechis and other Oskar Blues officials are in discussions with the building’s owner on a lease and remodel of the property. The Kluver-Moore Foundation is listed as the property’s owner, according to Larimer County Assessor records. The prospect of Oskar Blues opening a third restaurant comes on the heels of the company, known for its canned craft beers, seeing triple digit revenue growth last year. It also recently announced plans to add two more 200-barrel fermenters to its Longmont brewery, bringing annual brewery output to 40,000 barrels. If the talks in Fort Collins work in Oskar Blues’ favor, Katechis said the brewery would move forward with creating a “craft beer bar” and restaurant reminiscent of the Oskar Blues Home Made Liquids & Solids restaurant that opened in Longmont in October. That establishment has 43 craft beers — most of which are hard-to-find — on tap, southern-style food, a host of random adornments on the walls and a neighboring silo repainted as a beer can and filled with a handful of video games and pinball machines. Oskar Blues also continues to operate its original location in Lyons. If Fort Collins doesn’t pan out, Katechis said he would move forward with a property he has eyed in Boulder. However, he added, Oskar Blues is fairly far along in the due diligence process for the Fort Collins building. “(A Boulder restaurant is) an option, but right now, we’re taking it one at a time,” he said. Katechis declined to discuss further specifics of a potential Boulder location. The microbrewery-friendly city of Fort Collins and the building itself were attractive to Oskar Blues, said Tim Trapp, founder of Trapp Associates Ltd., a Boulder-based restaurant designer that is heading up Oskar Blues’ latest endeavor. The former depot has a “unique personality” to it, with its turn-of-the-century architecture and history as a train depot. The restaurant would be three-tenths of a mile southwest of New Belgium’s 500 Linden St. site. The restaurant also would fill a building that from 1992 to 1995 housed New Belgium’s then under 40-employee operation, said Bryan Simpson, spokesman for New Belgium. “I surely do think there’s plenty of room (for another brewpub),” he said of Oskar Blues, a “friend” that helped New Belgium in its canning of Fat Tire. 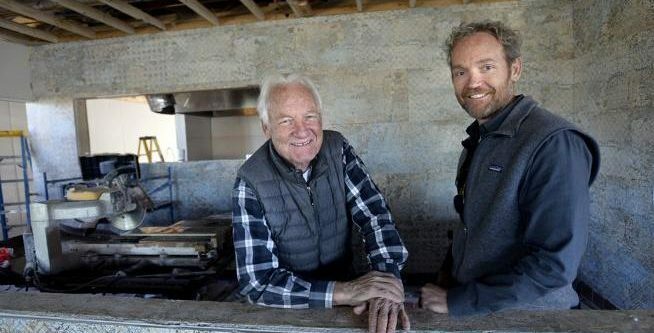 In March, the Vincent family — three brothers and their wives — bought it for $1.2 million; they plan a major renovation that will include a beer garden and brewery, led by former Dad & Dude’s Breweria brewer Bard Nielsen. Architect Tim Trapp, of Trapp Associates, is designing the overhaul; Trapp has worked on several other breweries, including the Walnut Brewery in Boulder, various Rock Bottom locations and the Denver ChopHouse. But El Rancho isn’t the only brewpub slated to start pouring beers in Evergreen this year. Anders and Debbie Ruikka, who bought the Evergreen Conference Center two years ago, are adding their own brewery and restaurant to the facility by fall. Originally called Fireweed Brewing, the business recently had to change its name to Lariat Lodge Brewing in order to avoid a trademark battle with a similarly named whiskey brand from a Montana distillery.